Sharpening up the corporate message. Preparing for 'direct to camera' videos. Tom Maddocks is acknowledged as one of Britain's leading media training and presentation coaching experts. He has over 20 years' experience as a journalist and broadcaster in TV, radio, and the national press, including BBC TV, BBC Radio, and Channel Four TV. For several years Tom was a reporter on BBC2’s 'The Money Programme'. Tom now works to improve the communications skills of senior spokespeople at many leading companies in the UK and elsewhere in Europe, both in small groups and one-to-one. His clients range from government departments, banking and financial institutions, media and technology firms, to small charitable organisations. With Tom at your side you'll learn how to sharpen up your corporate messaging in print, radio, and TV and develop the skills to handle yourself in a public-relations crisis. Tom also provides tailored coaching on both delivery and content to help you prepare for a forthcoming presentation, whether to an individual client or large audience. "I used to take it for granted that most people have a general idea of what 'media training' might entail, but have come to realise that it's an assumption I shouldn't make. Some people seem to imagine it's all about making sure interviewees never say anything interesting, and are always 'on-message' to the point of tedium. I hope this little video will set things straight!" See Tom’s training tips and more at mediatrainingassociates.co.uk. 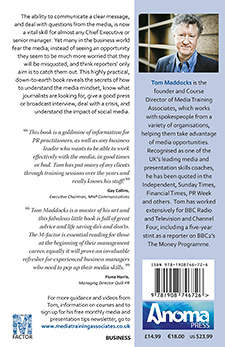 Tom is the author of The M-Factor: media confidence for business leaders and managers (2013) which is available in paperback or as a Kindle download from Amazon. If you want to understand how to get the media on-side, in good times or bad, this book is a good place to start. Tom Maddocks is a master of his art and this fabulous little book is full of great advice and life saving do's and don'ts. 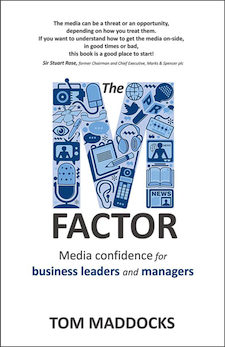 The M-Factor is essential reading for those at the beginning of their management career, equally it will prove an invaluable refresher for experienced business managers who need to pep up their media skills.